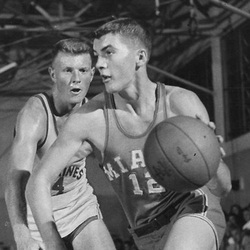 In the days before 3-point shots, high scoring offenses, and when freshman were not allowed to play, Ed Morris made a name for himself as one of the Hurricanes pioneering cagers, becoming the Canes first "Double/Double" man. Recruited by legendary Coach Bruce Hale out of Elwood, Indiana, Hale considered him "one of the teams most valuable all around players. He can rebound and score with the best of them and is a real team player." He set a school record in 1956 with 322 rebounds in 26 games, as well as scoring 419 points and shooting .472 from the field, 6th best in the nation. He was named an honorable mention All-American in both '55-'56 and '56-'57. He left UM with records in career rebounds with 787, and career free throws made with 308 in his three year varsity career. He scored 990 points in 74 games, and, at the time, only 3 players had higher point totals than Morris, including high school and Miami teammate and UM Hall of Famer Gene Stage, who had 1192 points. Morris ended his career with 42 "Double/Double" games...gaining double figures in both scoring and rebounds...in the 74 games he played. He was named the teams MVP in both the 1955 and 1957 seasons, as well as being named to the All-Tournament Team of the 1955 Orange Bowl Classic, along with West Virginia All-American Rod "Hot Rod" Hundley, after outscoring him 59 to 47 in the tournament. A fierce defensive player, he is still 3rd in school history with most disqualifications from games due to fouls. Ed graduated from Miami with a Bachelor of Science degree in Architectural & Civil Engineering, and spent 35 years designing churches throughout the South.